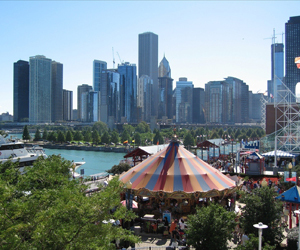 Being the 3rd largest city in the US, Chicago is easily recognized for its well-known iconic landmarks, such as Magnificent Mile, Chicago Theater and Loop, Willis Tower and Field Museum. Planning your trip to Chicago and making a to-do and to-visit lists? You are heading to the right destination offering loads of activities and discoveries for the most curious tourists. From the magnificent skyscrapers of the Loop to the picturesque mosaic of different neighborhoods, Chicago always abounds in energy and passion. The shopping fans will find the paradise on The Magnificent Mile, outdoor activities lovers can ice skate in Millennium Park. Indoors, relax at a luxurious spa, enjoy drinks with a stunning view or dance the night away at a disco. You will see about 4,700 restaurants on the culinary map of the city and enjoy dining in the world-class restaurant boasting countless awards or find an inexpensive dining with a wide variety of cuisines. For art and culture amateurs, the winter is the right time to go to Chicago. Get lost in the gallery districts and explore the Art Institute of Chicago, that was chosen "No. 1 Museum in the World". Any of sensational performances you have seen in Chicago, let it be opera, ballet, comedy or live music concert, will make you experience the unforgettable moments. Theater experts and amateurs can discover the vigorous theater scene at Broadway, Steppenwolf or Goodman in Chicago. The image of Chicago as a very passionate sports town is spread even beyond the United States. Regardless of your travel purpose, the best restaurants, hotels, shopping malls, entertainment parks are waiting for you in the largest and the most popular city in the Midwest. Not to forget the celebrated architecture, beaches and lakefront activities and energetic nightlife with jazz and blues to get the complete idea about the opportunities Chicago offers. The main airport of Chicago is O’Hare International Airport, considered to be the world’s second busiest airport. It is situated on the far Northwest side, while Midway International Airport is located on the Southwest Side. According to statistics data, in 2005 O’Hare was the busiest airport in the world in terms of aircraft movements and the second busiest by the passenger traffic. Find cheap domestic flights to the USA. The City of Chicago owns and operates both O’Hare and Midway. There are some other airports that can serve as replacement, however the volume of commercial flights is less than at O’Hare and Midway. These airports are Chicago Rockford International Airport, situated in Rockford, Illinois, and Gary/Chicago International Airport, located in Gary, Indiana. The United Airlines, the world’s third largest airline has its headquarters in the City of Chicago. Keep this in mind when searching for cheap airline tickets to Chicago. The most valuable time to go to Chicago is summer or fall. Many special events are held in summer, and hot, muggy weather foster numerous outdoor activities, however it is also the time of the biggest crowds. In autumn the days are mostly sunny, the daytime temperatures are moderate, and the crowds at major tourist attractions are smaller. So if you are planning mostly indoor activities, winter could be a great time to visit the city. Be aware that the weather is sometimes blustery in winter. The upside is that the city’s attractions are less crowded and it is easier to find hotel and flight deals. Spring weather is often unpredictable. Mobissimo has multiple ways to help travelers find cheap flights to Chicago. You can subscribe to our weekly cheap flights and deals newsletter which includes great deals on cheap flights. We provide an Airfare Index that you can subscribe to on our front page which will alert you to the cheapest flights to Chicago via RSS. When your search on Mobissimo is finished we provide a recommendation box with dates when the flight to Chicago is the cheapest. There's our Facebook page where you can connect to people who are looking for great deals to Chicago and where we also post cheap flight deals regularly. Our blog provides highlights of sales on flights on major carriers. We also have a flights deals page that is updated daily. If you're looking for cheap domestic and international flights to Chicago, USA , it helps to be flexible with your travel dates. Being able to leave on a Thursday or come back on Monday, and taking early morning flights, will help you find cheaper flights than the busy and popular early evening flights and late afternoon flights for Chicago. Searching during the travel off season for Chicago will also help you find the best fares. Keep in mind to search for the cheapest flights to nearby cities airports. Mobissimo is the ultimate travel search engine for all USA destinations.